I'm finally sharing a much-requested (by one person) post about the capsule project I recently did. And I am very cleverly calling it: End-capsulating, because I actually loved doing it and I'm thinking this might turn into a series of sorts. + and a few things I learned along the way! 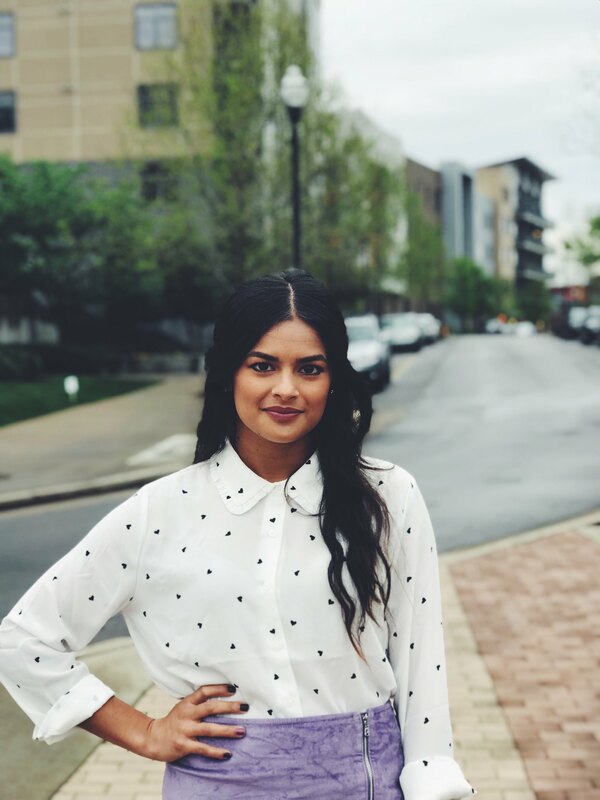 In early Spring of this year, I found myself feeling completely uninspired and unsatisfied with what was in my closet. I constantly had that dreaded "nothing to wear" feeling, which is ridiculous, because I own plenty of clothing etc. 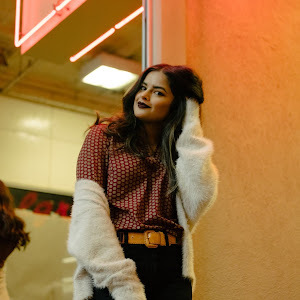 So I decided to do what every blogger does! A capsule! I included "capsule project" in my small goals for April, put it off for a while (more on that later) but completed it during the second half of the month. If you're unfamiliar with capsules (...welcome to the internet?) they're basically part of the minimalism trend, where you limit yourself to a certain amount of items from your closet, for a defined amount of time. There are no hard and fast "rules", necessarily, but most typically the number of items you pick corresponds with the number of days in your challenge (so, 15 pieces for 15 days.) I've seen projects like this happen all over the blogosphere, so I'm not sure who to directly credit, though Kendi Everyday's 30x30 is the first one I ever remember seeing, and more recently, Caroline at Un-Fancy does capsule variations quite frequently. Ok, so here are the goods. I honestly, purposely went a bit off the rails. 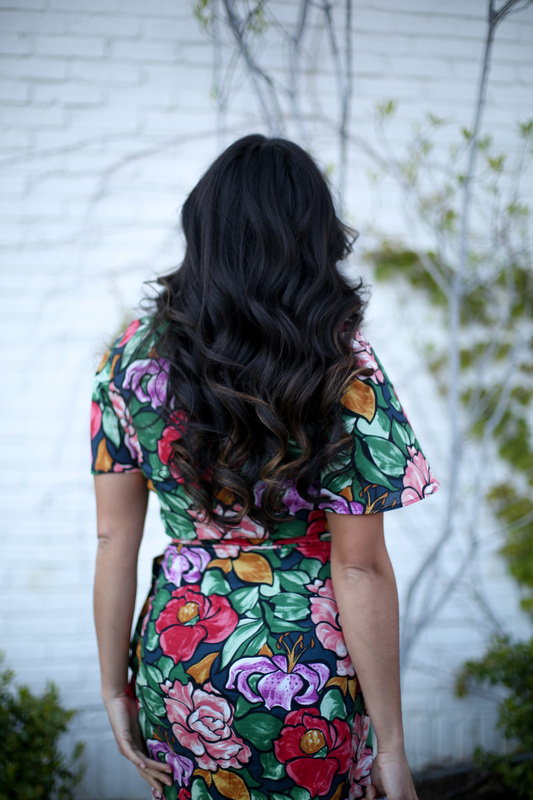 I knew my boutique dress would be a challenge to wear more than once (spoiler alert: it was!) In another brave move, I chose blue velvet booties over black leather booties, just for fun. I also really wanted to include my black Zara leggings, but in a small goal catastrophe, they were at the tailor's for the duration of this project! I've linked below to the items where possible, or similar otherwise. Because some of these are V random and old! Let's take a look at a few of the MVPs of my capsule, together in one outfit! I did intend to take some "actual outfit pics" on a few days (ok, this counts), just because the lighting in my room is sub-par! 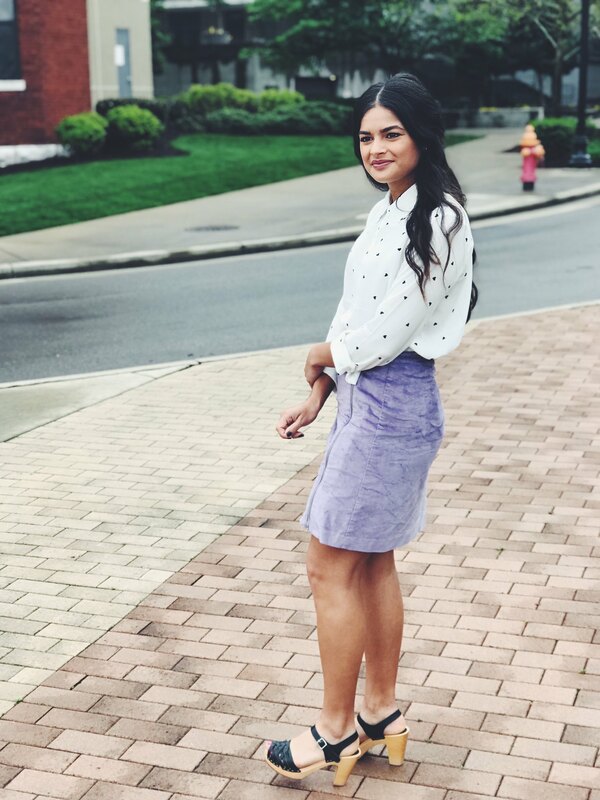 This skirt was a really fun pop of color to add into a mostly neutral capsule. I was mostly just excited to pair it with this new blouse, since I've struggled with styling this newish skirt exactly right. Oh I also washed this skirt right before this and yikes, it looks a little rumpled. How did I do? Pretty well, overall. I managed to not wear the same exact thing twice (though Day 15 and Day 10 came pretty close.) I also, for the most part, liked what I wore and didn't feel restricted by the capsule! 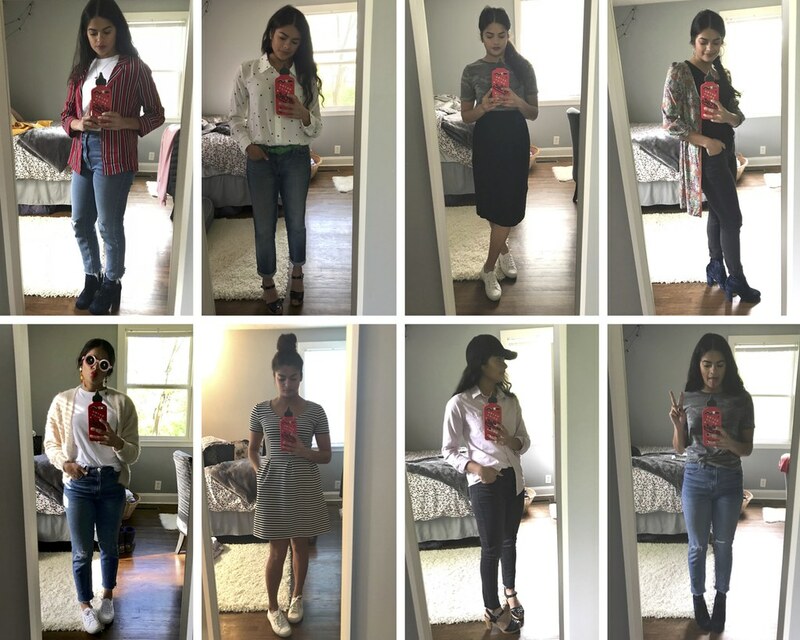 My favorite outfits were probably Day 1, 3, 4, and Day 12 (sorry these pictures don't have numbers!) My least favorites were Day 6 & 11, just because they were boring, not that I wouldn't necessarily wear them again. Most surprising combination that worked? 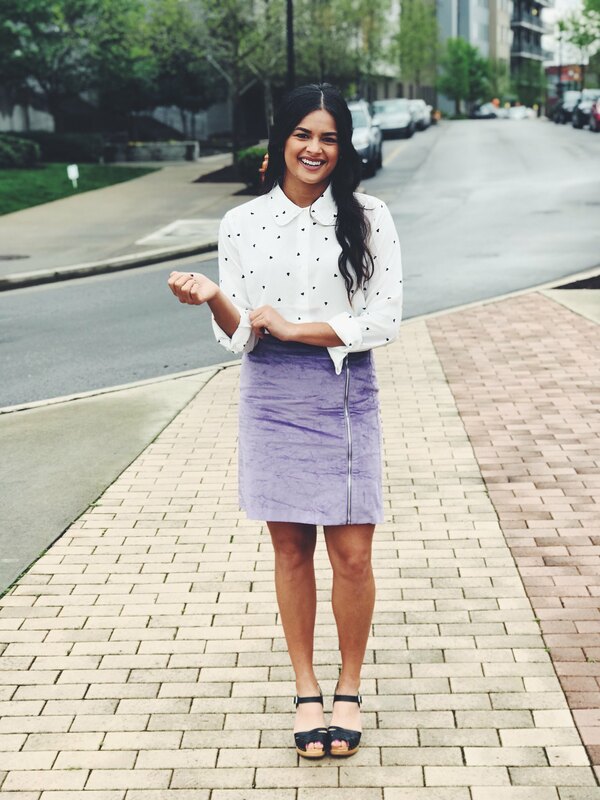 The red blazer and purple skirt on Day 12! Capsule MVPS? My girlfriend jeans and black jeans were each worn 4 times, no surprises. I also really really liked my new camo t-shirt. + Make your capsule work for you! I found myself putting off this challenge until I really stopped to consider why it was stressing me out. I realized then I needed to do it in the way that worked for me, so, I decided on a Monday-Friday, Workweek capsule, with flexibility to wear what I wanted on the weekends. There's no "right" or "wrong" way to do a capsule, so make it your own! + Accessories, my dear Watson. I know this is nothing new, but it's something that really helped me out! 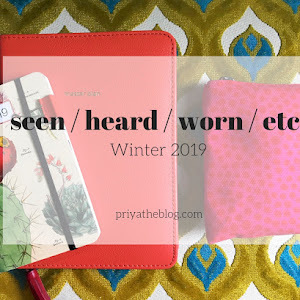 Because I felt like I was wearing the same four things, I turned to accessories (that, I'll be honest, usually sit dormant) to complete my outfits and make them a little more interesting. This was such a great reminder to work with what I have. + Capsules really do make getting dressed a snap! The Paradox of Choice is nothing new, but it was one of those things I needed to see for myself. 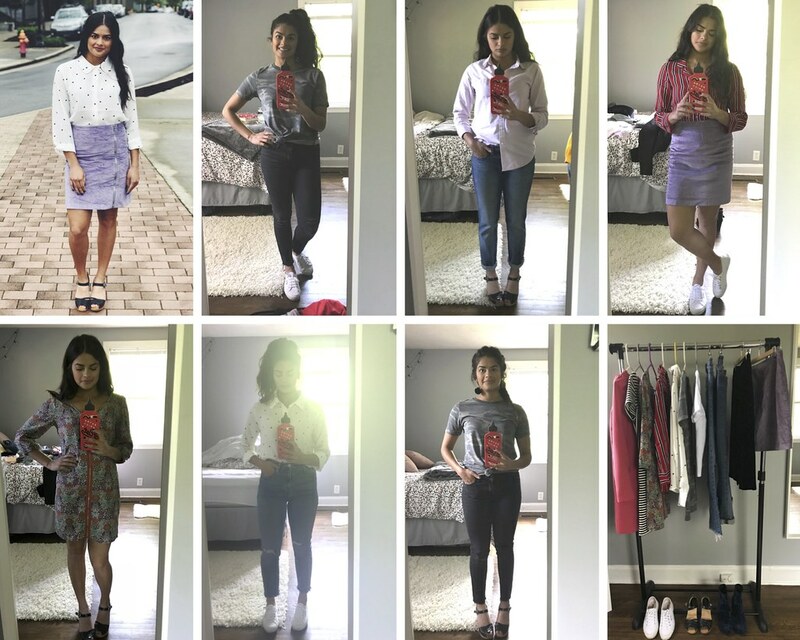 Having 15 pre-selected items on a garment rack in my room REALLY DID make getting dressed in the mornings EASY and gave me a newfound appreciation for how versatile my closet can be (which was the goal!) Try it! Whew! Thanks for reading this doozy of a post! If you've done a capsule project, I would love to hear about your experience. Please share with me in the comments! 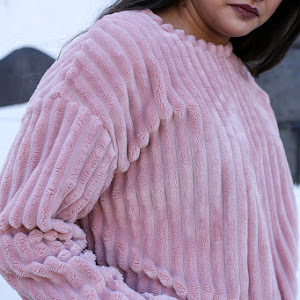 Juuust realizing my last outfit post also included my Supergas, fuzzy cardigan, and pink circle sunnies. What can I say? I know what I like. And I like wearing them non-stop. This dress does feel a bit like a hospital smock, and I'll be honest, it was way overpriced for what it actually IS. But whenever I get the chance to go into Zara, I'm kinda like, determined to find something. The print is to die for, and with a safety pin up top, the fit is to die for too! I always forget how flattering and wonderful wrap dresses are until I wear one, and then I wonder why I ever wear anything else?? This purse is OLD (like, high school) and what do you know, lavender (or, "Melodramatic Purple") is currently THE color of the moment! I don't want to advocate for my "hoarder" tendencies but truly, everything comes back in style if you hang on to it long enough. 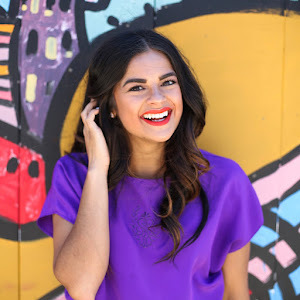 If you know ONE thing about me from reading this blog, it's that I am obsessed with purple in all her various shapes and flavors. After using this purse for a few weeks, and then having to throw it away because it was really time, I'm thinking I need to fill the lavender satchel void in my life. I'll never not feel weird saying this but I really love how this outfit and these photos turned out! Hope you're having a great week, whatever you're getting into! We've had some really lovely weather in Nashville, puppies from a shelter in the office today, and I'm going to see Vance Joy tonight! This weekend I am headed to Atlanta for my friend Hillary's wedding which should be fabulous. Thanks for reading! 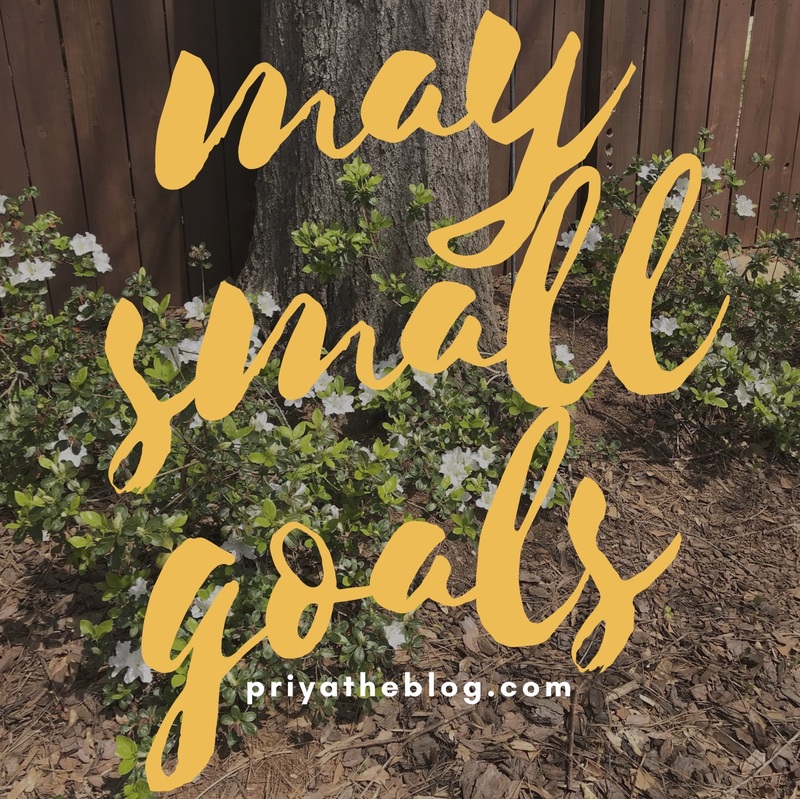 We're 8 days into May, but hopefully not too late to still be sharing small goals for the month! April was a busy and fun month that culminated with having my family in town for marathon weekend. May will be a month filled with weekends away; in fact, my only weekend in Nashville this month already happened! The weeknights should be pretty chill and good for knocking out what I have planned to accomplish. 1. Get my house close to done | DONE! I am so happy to be settled in my new (ish!) place after moving in February. I needed to furnish an entire living room, among other projects! I still have some fine-tuning to do (let's be honest, this will probably go on forever), and I want to get my deck warm-weather ready, but otherwise, I'm set for now! 2. Do a capsule project | DONE! Guys I did my first capsule project ever! 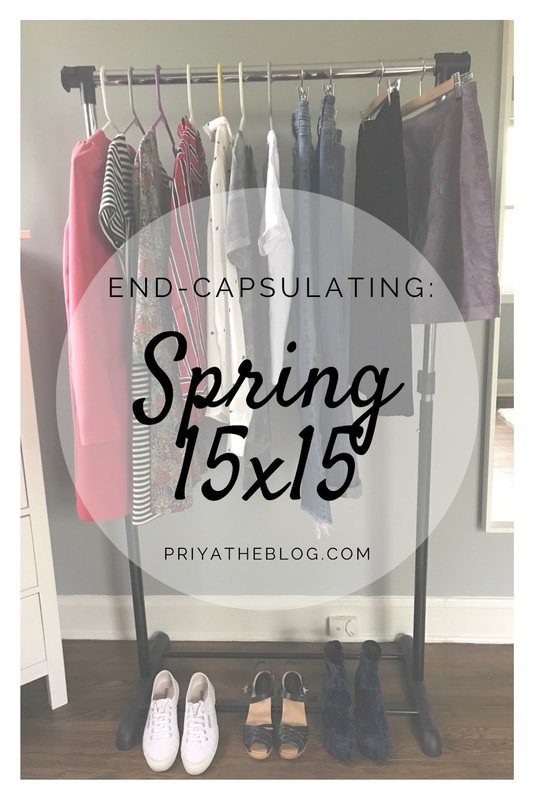 I shared daily updates of my 15x15 Workweek Capsule on Twitter and you know, I really enjoyed it, and my friends told me they didn't notice me wearing the same five things. Would you be interested in reading a capsule breakdown post? Let me know in the comments! 3. Qualify for the Boston Marathon | NOPE. I addressed this more thoroughly in my weekend update post, but no, I didn't qualify for Boston, not even close! The Nashville marathon was a super tough race for me, one that I felt very accomplished simply finishing. I'm honestly more disappointed to have had a miserable few hours than I am that I didn't achieve my goal, so no big deal. 4. Sign up for a new credit card | DONE! Per my sister's recommendation I now have the Chase Sapphire Reserve card which comes with a lot of cool travel perks. 5. Adjust my finances | DONE! I'm looking back at this goal wondering exactly what I meant by it, ha. I am at least organized with what bills are due when and whether or not they are automated, which feels like the point behind it. 6. Visit the tailor | DONE! 1. Do a de-clutter project. I am so excited about this! Now that I have all my junk hidden and arranged in my new place, it's time to DE-CLUTTER! I got the idea for a 30 day decluttering challenge from an old co-worker of mine. I simply pick one drawer or place or topic per day and tackle it. 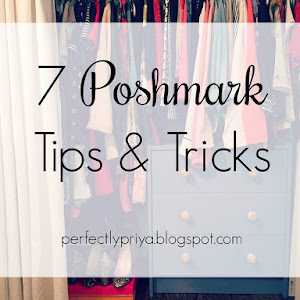 It works great because I can pick something small on a busier day (my wallet) or something bigger on a Saturday (my closet!) I'm off to a good start and can't wait to report back on this! I am so thankful to have the month of November OFF as a sabbatical. While I have the "skeleton" of my plans in place (along with international flights) there are a thousand smaller things to research, plan, and book. Mostly in India, because I'll luckily be with family and friends in Finland and California. Please share any of your ideas or must-dos with me! 3. Apply for Global Entry. One of the cool perks of my new credit card is that it covers the cost of Global Entry, which will come in realllly handy for my sabbatical but also just life in general. 4. Apply for India Visa. So number 3 & 4 are basically part of number 2. I guess I could have made this list more diverse, but, hopefully by the end of the month I'm close to done planning my sabbatical! 5. Be a self-care queen. I can't put my finger on exactly what has made me feel a little run-down and worn-out lately. The answer is ahhh-bviouslyyy some serious self-care. 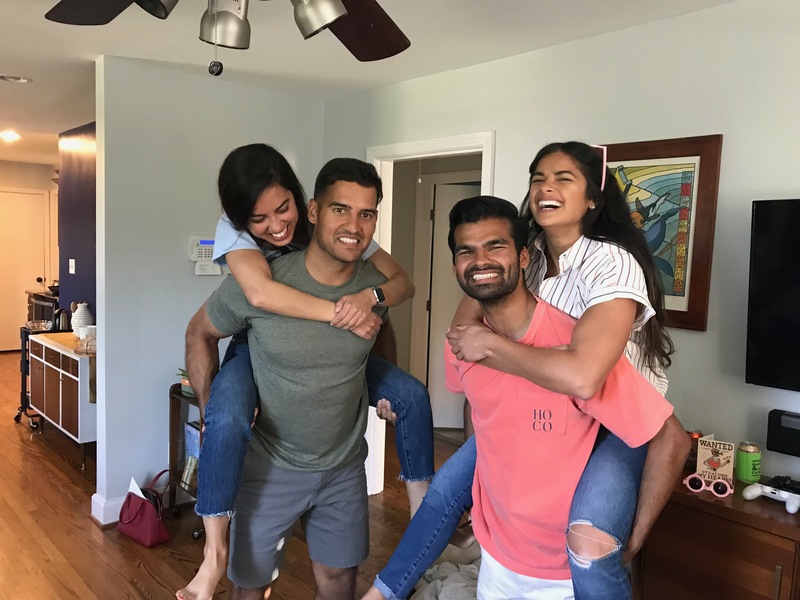 Nicole is the reigning self-care queen, and I couldn't find the post where she specifically said "sometimes self-care feels like more things to check off my to-do list", the remedy being, there's no RIGHT or WRONG way for YOU to practice self-care. With that in mind, I've been asking myself the question "how can I take care of myself right now?" a lot lately, as well as just being more intentional about how I do certain things (for example: getting ready for bed.) Hopefully I will have some ideas to share at the end of the month about what worked! I would love to hear what you're working on in your life this month! Share below! Happy Boxycharm day, a bit delayed! Every Boxycharm had a ColourPop palette this month (so cool!) I almost ordered one awhile ago and I'm so glad I didn't, love when this happens! I was SO excited about receiving this gorgeous palette (seriously, check out the packaging) because I love their products I've tried (Lippie Stix + Super Shock Shadows.) Their shades are so unique, for example, the top left shade, Golden Egg, is a "pinky beige with turquoise glitter." However, though gorg up and down, I have to say, I like the formula of the Super Shock Shadows better. They have a mousse-y texture, while these have been a bit chalky in my opinion. I'll still be using it though! When it comes to highlighters, I haven't found a liquid one I really love. I've tested this a few times, and while I wouldn't grab it over one of my go-tos (Wet n Wild or Becca Champagne Pop) for a regular day, I've found it looks incredible on your cupid's bow! I know that's so random! I'll save it for when I'm being totally extra and wearing more than one highlighter. Also, always excited to try a new Tarte product. We've just about received the entire Dr. Brandt line via Boxycharm in the last year (PoreDermabrasion Exfoliator and Luminizer Primer - my fave) and these products are all about the same to me. I don't dislike them, I enjoy using them, and I appreciate that they are pricey because I wouldn't purchase them on my own. I never notice a huge difference either way, but after trying this mask one evening my boyfriend swears he broke out! So idk. I wasn't even going to slam this when it was more of a gloss than a liquid lipstick OR because it's "just ok" all around - until the "doe foot" end broke off when I was applying! So this gets a solid thumbs down from me. If anyone has any ideas about how I could still use this with a broken wand, let me know! This surprised me by being my favorite item this month! And don't get me wrong, I already loved a tinted spoolie, but this one is noticeably better than my usual $3 Essence Make Me Brow. It's not as "wet"/messy and it has these little fibers that make your brows look amazing with just a swipe! I've been using this daily since I got it. 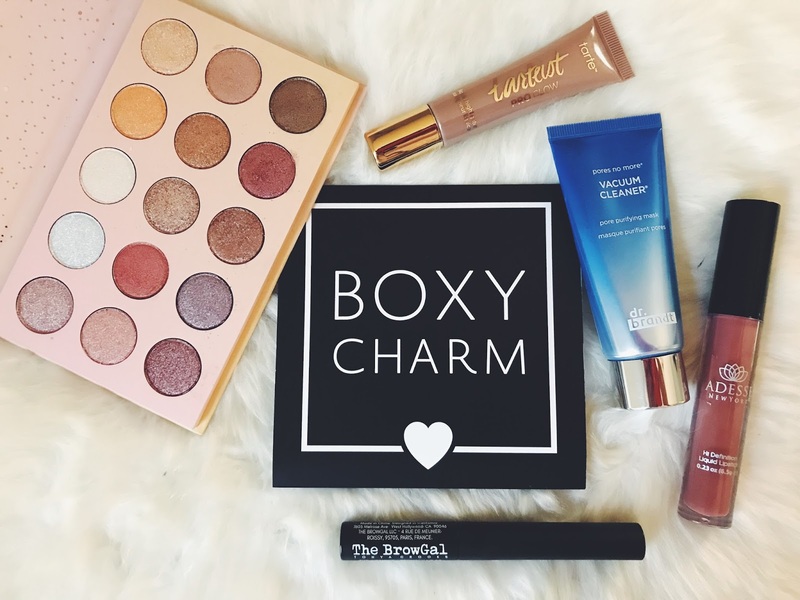 Let me know what you received in your Boxycharm or other subscription service this month (literally always down to talk about make-up/products) and view my past reviews here! You might notice that this does not include photos from the race, because - it was terrible! I'll address that straight up, I did not qualify for Boston, not even close. As disappointed as I am to have not accomplished my goal, I'm more disappointed that months and miles of training ended in a run that I did not enjoy at all. But you know, in my years of running, if there's one thing I've learned, it's that the bad races are guaranteed, they just happen! I'm not looking for sympathy, because I'm really ok with it. Honestly it was a small victory for me to even finish the race, considering how badly I wanted to quit starting at about mile 11 (seriously.) For about the last 6 miles I was promising myself I would never run again and certainly never a marathon, but I'm already over that :) because my last marathon ever needs to end on a good note. ANYWAY I love my brothers and sisters so much, you guys! I was so bummed on Monday when everyone was gone! Like apart from loving them out of familial obligation, they are just the most fun to do anything with. Sometimes I pretend they're just a cool group of friends that I have. I'm already scheming up a lake weekend this Summer with everyone. 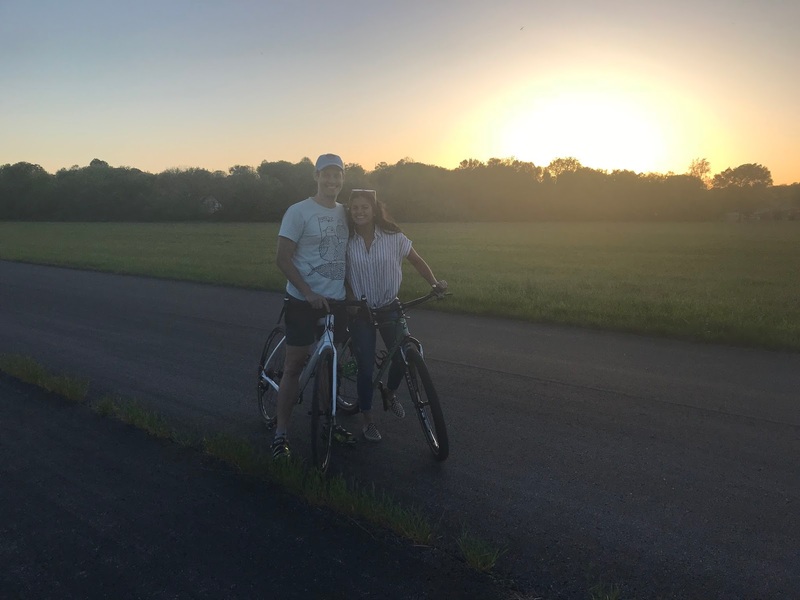 I think the highlight of my entire weekend was spending Sunday afternoon grilling and hanging out and eventually going on a golden hour bike ride (my bf has enough bikes for all of us, lol.) It was absolutely perfect and what I want to do every Sunday. We also: made Shalane Flangan's Marathon Lasagna on Friday night (it didn't help), checked out the new Topgolf in Nashville, had dinner at Nicky's Coal Fired, played ping-pong at Clyde's (obviously), made breakfast burritos at home, and Amir helped me string lights on my deck but they fell and shattered and now it's a nice little deathtrap where I'm only inviting people I hate.